MARTHA MOMENTS: Meet Martha in Toronto! Martha Stewart will be in Toronto on Tuesday, October 4th, to officially launch the Martha Stewart Collection at Hudson's Bay and Home Outfitters stores across Canada! You can meet Martha between 5pm and 6pm at the Hudson's Bay store on Queen Street. The introduction of the Martha Stewart Collection to Canadian consumers has been a long time coming and I'm so excited to finally have access to so many of these great products! I will not be attending this event, unfortunately, since I no longer live in Toronto and will not be able to travel there that week. I would have liked to have said hi! For more details, visit the Queen Street Hudson's Bay store or call (416) 861-9111. All these years later, it is reality. I believe it will be expanding. 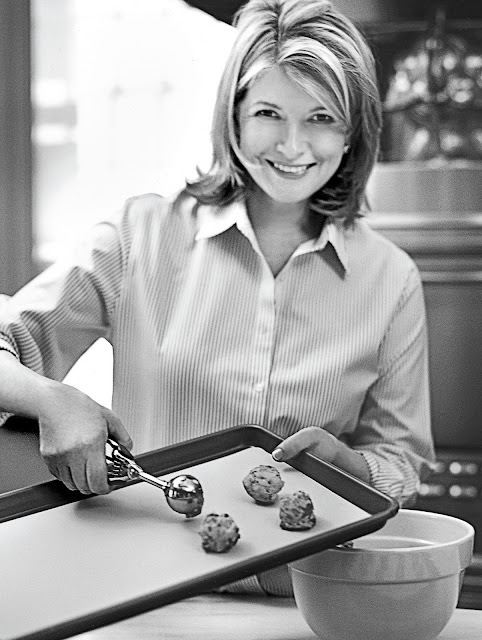 On The Bay's website there are numerous kitchen products by Martha Stewart. By the looks of Martha's blog (today 6 Oct), Hudson Bay has given Ms Stewart's product line a beautiful and welcoming starting point at there flagship store. PS your choice of a photo for your current header is beautiful. Wonderful to hear that, you are so lucky to see her again. Kindly give her by regards and best wishes. The brand is just not for me anymore. I never get excited about new product releases or designs. I think it has been diluted to the point that if Martha's name was not on it I could not identify it as her product. Maybe that will change as time goes on. Other designers and Williams Sonoma are more interesting (for me) currently. I have many of her early Macy's line. The dishes used to be a better quality. Perhaps everything is just disposable now.